My poor son Frederick suffers fairly severely from seasonal allergies. In the spring of 2012 his allergies were so bad that we allowed him regular over-the-counter allergy medication for about six weeks. There were days that his symptoms were so bad that we watched the clock eager to give him his next dose. At the time he was consuming local honey and sleeping with a diffuser loaded with respiratory essential oils. These complementary therapies did seem to help but he still needed the medication. Our foraging adventures in 2013 landed us with a keen remedy: nettle leaf. I have written about it before here. We have a number of posts on the site featuring nettle, including our nettle soup and the beverage we make with all of our nettle stems (after removing the leaves for our soup and freezer stash). With a remedy so powerful for him we have had to create a streamlined process for keeping him loaded with nettle and this is it. He does also eat nettle soup regularly but this is a drink I keep in our refrigerator and I pack in our cooler anytime we travel during allergy season. 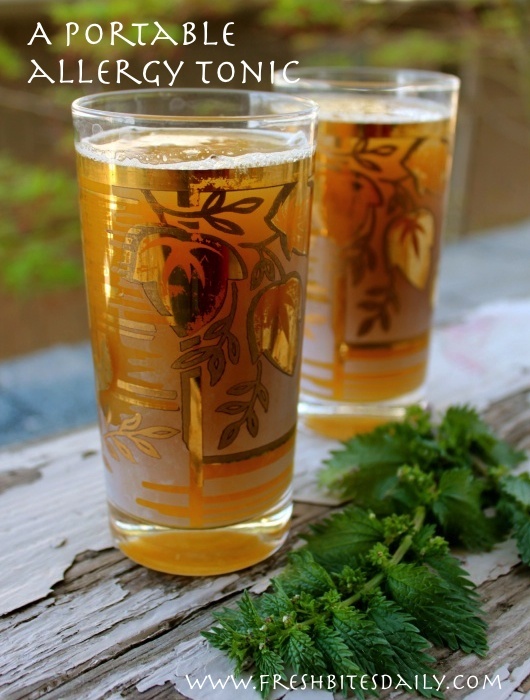 It’s simple: A strong nettle infusion mixed with orange juice. An “infusion” is simply a strong tea. We add the orange juice to “make the medicine go down.” Citrus is a great complement to nettle, covering over some of the rangy flavors of a strong nettle infusion. Orange juice also sweetens the concoction enough to make it a go-to drink for a child. During the allergy season I keep stock in my refrigerator one half gallon mason jar of nettle infusion and one jar of orange juice. The components are ready when my son is. 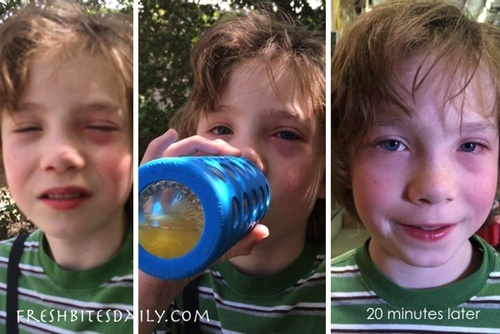 He typically has a preventative glass in the morning and around noon (about 8 ounces each). If he shows signs of an allergy attack, he has another glass. With this regimen, this past season he took medicine about four times, largely because we found ourselves without his tonic. His most memorable allergy attack was actually at a zoo-like park out of Bakersfield, the California Living Museum (CALM). It is filled with California’s native animals and native plants. If you want to be exposed to spring pollen, visit a park that has several hundred California native plants blooming at one time. You can really test your allergy tonic. We were at CALM for about 25 minutes when the symptoms set it. They got severe quickly and we walked briskly to the car for his remedy. He sat at CALM and drank it, still exposed to the allergens. As much as the rest of us desperately wanted to stay we realized we were sitting in an allergen soup and so we headed out for a last errand and then home. The errand was about a 15 minute drive. After the 15 minutes, Frederick was noticeably better. His eyes were still a bit red and puffy but far less so. More importantly, he was not completely miserable. He actually asked to ride on this mechanical pony. Twenty minutes before he was in complete misery. As we drove home his symptoms improved more still. I’ve actually gotten comments that these pictured are doctored or that my son is acting. We harvest nettle leaf for free in our area and nettle is commonly available across the country, completely free for most people to try. Try it for yourself and if it doesn’t work, try something else. It’s a fairly easy remedy to implement. In our household, we are never without this beverage on our road trips during allergy season. The only big precaution comes from our dentist: Orange juice is high in acid and if you are going to brush right after, give your mouth a good rinse first. An “infusion” is a very strong tea. Your approach may vary depending on your access to fresh or dried nettle. Pack your fresh nettle into a saucepan and cover it with boiling water. Apply a lid and let it sit overnight. 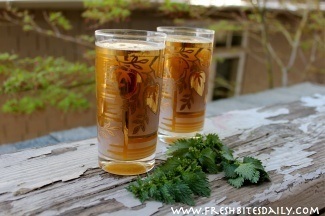 Strain out the nettle and reserve the liquid for your beverages. Refrigerate the liquid. It keeps well for one week. I make fairly large batches of this infusion, usually at least a half gallon. I use nearly a half gallon of packed fresh nettle in that case. Pour water over 1/4 pound of dried nettle leaf. Cover with a lid and let it sit overnight. I hope this remedy is as effective for you as it has been for us.